Smoothies are a great breakfast option. They are also good for mid-afternoon snacks. Rather than follow recipes, the best way to start making smoothies is to gather some ingredients in your cupboard or fridge. Spread them on a board and get your blender out. It’s always nice to have fruit as a base. 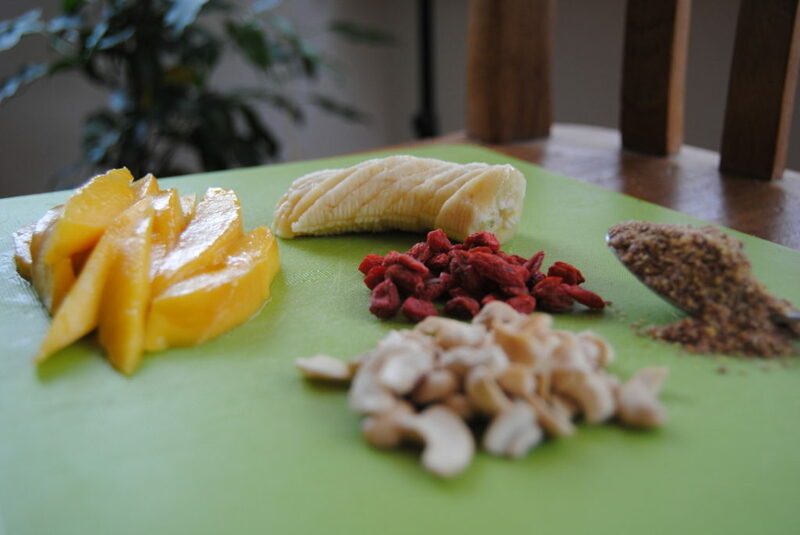 You can also add in nuts, seeds, water, yogurt or anything else you desire. The great thing about smoothies is that they keep the entire fruit. If you have a juicer, they are nutritious as well, but you don’t get to enjoy the fibre of the fruit. This can spike your blood sugar because there isn’t any fibre to slow down absorption rates. In this particular smoothie I added a mango, banana, flax seeds, cashews and gogi berries. Flax seeds are excellent for your daily source of omega 3-s, which are healthy fats that your body needs to function. 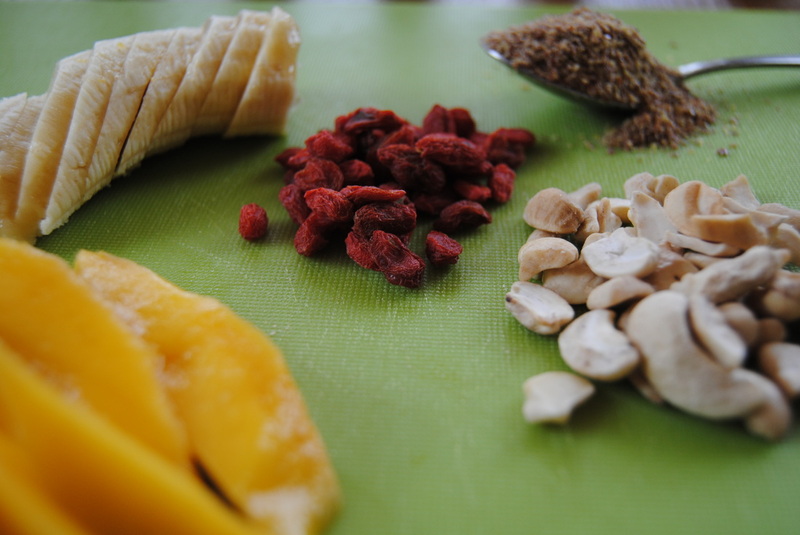 Gogi berries have a high antioxidant content which help fight off free radicals in the body. Bananas are an excellent source of potassium, while mangoes are high in vitamin C. Cashews are also a good source of healthy fats and protein. They also give smoothies and sauces a creamy texture. Blend it all together and enjoy! I added a little water to this one, to reach the desired consistency. Another option is to add yogurt. 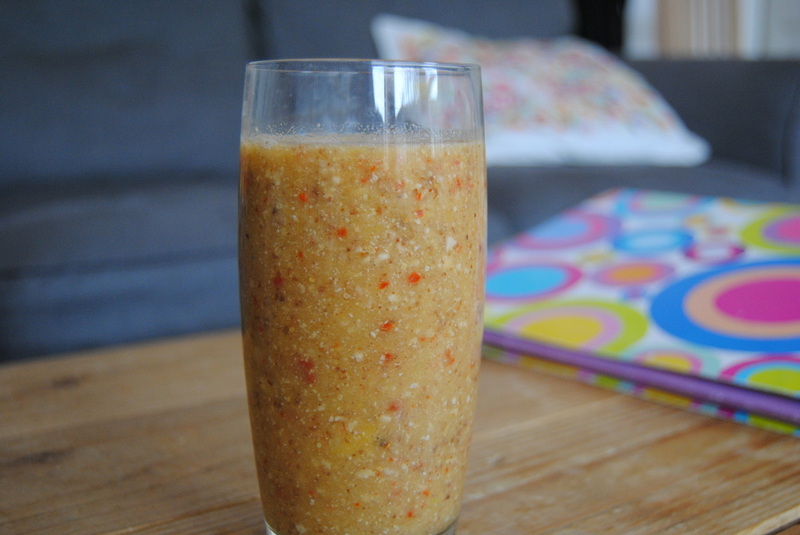 Smoothies are easy on your digestive system because they don’t take a lot of energy to digest. This will leave you with more energy for the rest of your busy day.